The 52in Toshiba 52Z3030 is the largest model in the company’s latest LCD TV range, and since it’s a flagship model we’re hoping for something extra special. It’s very well put together, with its glossy black bezel looking and feeling suitably opulent. And it’s also got all the specifications that matter, kicking off with a full HD resolution panel and three v1.3 HDMIs, capable of receiving 1080p/24fps signals from Blu-ray players, as well as the picture-boosting Deep Color format. Other connections of note include a subwoofer line out, a digital audio output and a PC jack. There are two key picture processing elements: Active Vision M100Hz and a 5:5 pulldown system for 1080p/24fps sources. The former takes Toshiba’s usual Active Vision system with its ability to boost colours, sharpness and noise reduction, and adds the 100Hz processing that’s designed to reduce LCD’s problems with motion blur. The 5:5 pulldown repeats each frame of a 1080p/24fps source five times, to make images more fluid. 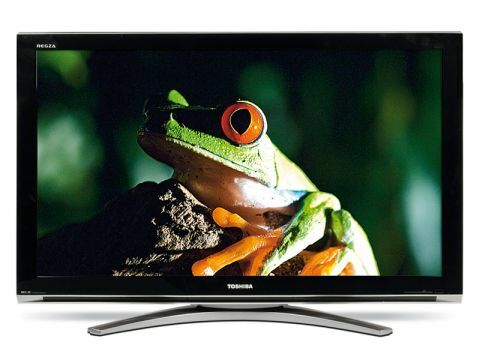 Does Toshiba's monster LCD deliver on HD? In action the Toshiba 52Z3030 is hit and miss. On the plus side it possesses a notably vibrant colour palette that drives pretty much any colour off the screen with real aggression. With relatively static footage, meanwhile, it also employs its 1080p HD resolution to reproduce every glorious detail of hi-def sources in stunning detail. At times black levels look very good, too, by LCD standards. However, black levels are inconsistent in that, while dark parts of the picture look convincing in high contrast scenes, generally murky shots suffer more from LCD’s greyness problem than we’d like. Black levels also drop off fast from any angle greater than 30º. Surprisingly, on a 100Hz TV, pictures are softened by quite severe amounts of motion smear. This issue blights everything except 1080p/24 HD sources containing significant amounts of movement. Colours aren’t perfect, either. For although they’re very vibrant, their tones aren’t always natural or consistent, and this is especially noticeable over skin and with standard-definition sources. In fact, the TV doesn’t really like digital tuner broadcasts much at all, leaving them looking noisy and generally rather artificial. The Toshiba 52Z3030’s sound impresses though, with bass levels that back up a rounded and detailed mid and treble range. But sadly this just makes the picture’s inconsistencies all the more upsetting.